steam reforming catalyst for nature gas BCR-2 is used at bottom of furnace companying with BCR-1. BCR-2 has been used successfully for amounts of gas unit since 1960’ which is designed for the steam reforming of rich heavy components gaseous hydrocarbons in a pipe reactor to produceammonia syngas, methanol syngas, city coal gas and hydrogen. 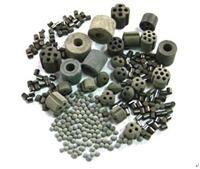 It is used in the top of reforming pipe companying with BCR-1 used in the bottom.